The Team Beachbody Blog explains the benefits of body weight exercises. While weight training is often synonymous with looking big and ripped, it’s not the only way to get there. Strategic use of body weight exercises can be just as effective, if not more, than the traditional stalwarts like the bench press and squat rack. Skeptics, since I know you’re out there, take a look at gymnasts. These athletes are some of the most ripped on the planet and they don’t use weights. Many modern programs make it both safe and effective to get ripped without adding weight. Gravity, not weight, is what we use to build muscle. Gravity creates resistance within our atmosphere, and that resistance can also be termed weight. That’s why the technical term for weight training is “resistance training.” Weights are merely a tool that used in the process of resistance training. They are a good one, too. They allow you to do all sorts of resistance exercises easily, and in a confined space. They also allow you to choose an exact amount of resistance, making using them more versatile than if you were to just rely on body weight and gravity. They can, however, be limiting and often are. Body weight resistance training uses more natural movement patterns. It forces your body to move functionally, or in a manner that helps your functionally in life. With a little bit of creativity, you can get all the effects of weight training as well as functionality advantages, and add “lack of equipment” to your pile of bad excuses. Let’s take a deeper look at how gravity is your friend. 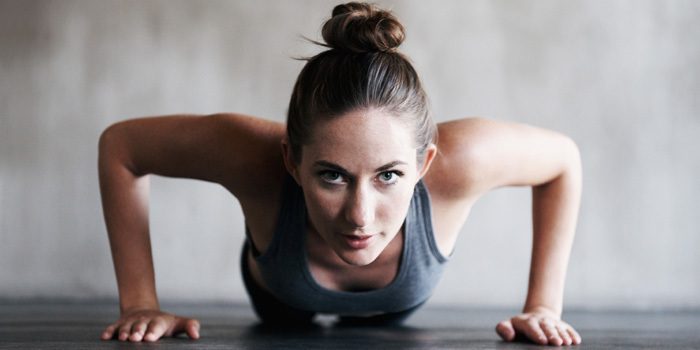 Let’s begin with an example using an exercise everyone knows: the push-up. Invert a push-up, and add a bar with weight, and you have a bench press. Up until the point you can bench press your body weight, you have two very similar exercises, only one of which requires pumping iron. For many people, a body weight push-up is completely adequate to build all the muscle you want. It won’t be for everyone, but you can increase the intensity of the push, by switching positions, taking away an arm, etc., to mimic the way you would add weight on a bench press. Unless you’re in a space ship, there are body weight exercises that will force resistance and build muscle without using added weights. The simplest way to add resistance without weight is by finding more difficult movements. If you’ve done a Beachbody program, which hang their hat on both creativity and utilizing as little equipment as possible, you’ve seen a lot of these variations. From push-up and pull-up variations, to side-to-side yoga movements to almost anything done from the plank position, to hybrids of them all (push-up to side-arm balance anyone?) the possibilities are endless. With this strategy it’s not that hard to create exercises where you fail due to stress at about the same cadence (time under muscular contraction) that you would using added weight. Instability is another way to add resistance without weight. This can be done using an unstable platform, like a stability ball, or simply by doing exercises in a balance-challenged position. For example, lifting a leg or an arm off the ground during almost any movement makes it tougher. Again, your goal for resistance training is that point of failure. If lifting a leg or an arm makes it harder to hold the position, you’re strength building. Stability training forces loads onto more muscles in your body than, say, doing most old school isolation training does. Detractors might say that this takes away from the muscles you are attempting to make larger, which is true. But isolation training is also old school. Stability training has a better overall training effect on the body. And a stronger training effect means that you have a more solid fitness base and can thus push harder in other areas. That leads to muscle growth with a more functional effect and a reduced risk of being injured. Plyometric training uses gravity at its highest loading capacity by going airborne. It’s one most effective tools there is for building absolute strength and changing body composition. Often called jump training, it’s actually ballistic training of all types, upper, lower, or core: anything that force you to explode on takeoff and then land after a period of being airborne. This process greatly exceeds the training effect that can be done using static weight in almost any application by forcing eccentric muscular contractions, which tell your body to fire something called high threshold muscle cell motor units. Plyometric training forces powerful and quick adaptations in the body that both add strength and build muscle much faster than traditional weight training. Because they are so stressful, it’s vital that this style of training be done strategically. Used correctly in conjunction with the above, as well as proper recovery modalities, they create a template for getting ripped quickly that cannot be matched, weight or no weight. Admittedly, there are limitations to how large you can get with body weight training. Every bodybuilder, at least in the last 50 years, has used weight training to augment the size of their muscles. If getting huge is your be-all-end-all, it will, at some point, become limiting to avoid adding some iron to your program. But if you goals lie anywhere shy of an Olympic gymnast, a creative mind and good old gravity is all you need to reach your dreams.